Week one of The French Open from Roland Garros is in the books… and as has been the norm for the Men’s side of Grand Slam competition… the “big 4” are still alive. Novak Djokovic, Rafa Nadal, Roger Federer, and Andy Murray have all survived up to this point… in what is the most grueling of all the Major Championships. The slow dirt surface tests every ounce of patience, determination, heart, and talent during the two week tournament. And as cliche as it sounds, truly “only the strong survive”. 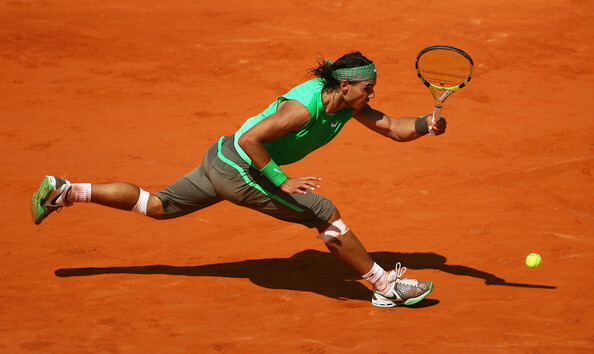 History shows that Rafael Nadal is the odds on favorite… and has truly been the King of Clay in recent years. Nadal has won 6 of the last 7 French Opens, and has only lost once at Roland Garros in his career. A close second to take the title of “Dirtball Champion” would have to be Novak Djokovic. “Nole” had one of the best years ever last year, going 70-6 on the year, and winning 3 Grand Slam tournaments … all except The French Open. In 2011 Djokovic went 6-0 against Nadal in tournament finals. But just a few weeks ago Nadal Defeated Djokovic in Monte Carlo to continue his dominance on Clay. Roger Federer, the number 3 ranked player in the world continues to cruise deep into another Grand Slam Tournament’s later rounds. The fluidity and grace with which Federer moves has allowed him to stay healthy throughout most of his career, which no doubt has helped him to play at such a high level for so long. Federer and Djokovic are both 1 win away from another Grand Slam encounter. Federer ended Djokovic’s 41 match winning streak last year in the semi-finals of Roland Garros… could this year bring another classic between the two? Last but not least, we have Andy Murray… the embattled and enigmatic Brit who can’t quite seem to get over the hump for his first Grand Slam Win. A few weeks away from the annual pressure of being Great Brittain’s only hope for a Wimbledon Champion, Murray is limping through the draw at Roland Garros. Some back issues have hindered Murray early, and at less than 100% I don’t see any way he can over come any of the Big 3 in a 3 out of 5 set match. And, frankly, I don’t see anyone who can beat Nadal in a 3 out of 5 set match on Clay… when Nadal is healthy. So, baring any injuries or outside circumstances, do we see Nadal raise his 7th French Open Trophy in 8 years? Odds are in his favor… but what do the other Big 3 have to say about that? This entry was posted in life, sports, Uncategorized and tagged Andy murray, Clay, French Open, grand slam, Novak Djokovic, Rafa, Rafa Nadal, Rafael Nadal, Roger Federer, Roland Garros, tennis. Bookmark the permalink.